This program is for children in Grades K-6 to stop by the Library to read to a therapy dog, trained to be an excellent listener. You may sign up for a 15 minute session to read to a new friend and earn a bookmark for your practice! 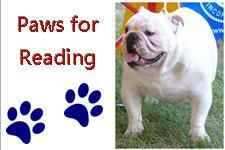 Please bring a book, or arrive with time to choose one from our collection to read to our dogs.